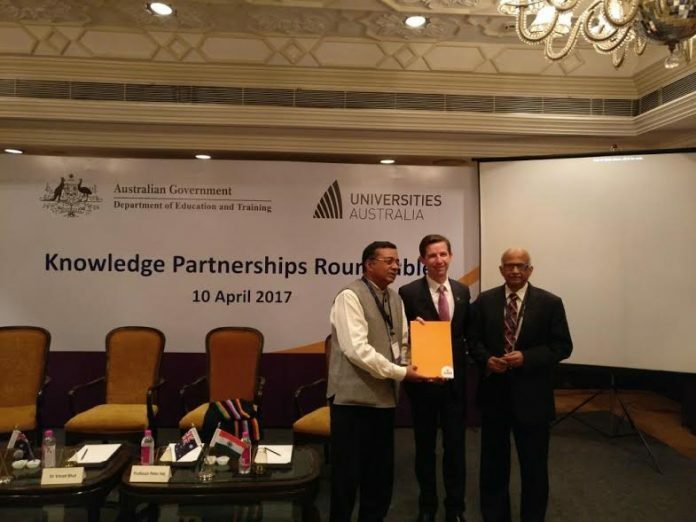 Bengaluru: Manipal Global Education Services (MaGE) and Deakin University, Australia today announced a strategic alliance to start education and training programs and establish Data Science and Cyber Security Centre of Excellence. The Memorandum of Understanding (MOU) was signed between Professor Jane den Hollander AO, Vice-Chancellor and President of Deakin University and A P Ramabhadran, Senior Vice President, Manipal Global Education Services. This MOU marks the coming together of two dominant professional education providers to formulate and derive solutions to valuable corporate and societal problems and construct new machine learning technologies to interrogate relevant data. The scope of this engagement involves solving sector specific big data problems, developing new knowledge and practices in new complex problems and bringing methodological consistency that are particularly relevant to the Indian context. Expanse of Internet in India has led to a quick adoption of technology by businesses and enterprises. The Digital India initiative by the Government is accelerating the adoption of Digital Technologies by its citizens. Increasing use of technology in the form of Mobile Banking and Payment Wallets, eCommerce and Online Education are opening avenues for cyber-crimes and cyber-attacks on banks, large financial institutions, manufacturing organizations and hacking of personal information from social media sites. These incidents have the potential to cause heavy disruptions in the Digital India initiative designed to transform the country. Ranked in the top two percent of world universities by Academic Ranking of World Universities (ARWU), Deakin University is a world-class institute with cutting-edge facilities and renowned quality of research and teaching. Backed by a strong cyber security department, Deakin offers various courses, certificates and research offerings in the sector. The Centre for Pattern Recognition and Data Analytics (PRaDA) at Deakin University discover patterns in big and lean data, and use these insights to solve real-world problems. Researchers at PRaDA develop new tools and technologies that harness data for practical use. secure network architectures, assessing and reinforcing the security of websites, responding to cyber security incidents. Students will develop skills that are crucial to the success of the country’s digital future while gaining the expertise required to take on roles as an expert on Cyber Security and Data Sciences in technology companies, government organizations and law enforcement agencies. Mr. A P Ramabhadran, Senior Vice President, Manipal Global Education services said “The MOU enables Manipal Global’s professional services arm to bring in solutions to industry which can help solve reskilling challenges in the digital and cyber security space. The Centre of Excellence will throw open solutions already existing with the “Pattern Recognition and Data Analytics Centre” at Deakin Australia to solve analytics challenges faced in the healthcare, IT and BFSI sectors. In addition, the COE will also work to solve, through cutting edge Machine Learning and Big Data solutions, the larger societal challenges in India relating to Financial Inclusion, Education and Healthcare” he added. The COE intends to investigate and discover valuable problems in key technology areas in the Indian ecosystem – health, insurance, banking, security and education. It will add early value into the corporate sector by enabling it to solve problems which have already been tackled globally, hence enabling translation of global learnings with speed into India.